In the online shop you will find an extnsive catalog of cork products how stoppers with wooden cap, boards , natural cork , decorative cork , cork rolls, self-adhesive cork , cork , buy cork , cork for acoustic insulation and many others. If you have any doubts about stoppers with wooden cap we recommend you get in touch with us so that we can help you with advice without obligation. Corkshopbcn team have an extensive experience in the manufacture of cork products with over 50 years. This knowledge allow us to offer the highest quality products like stoppers with wooden cap and increased efficiency in customer care. With caps There are 2 products. 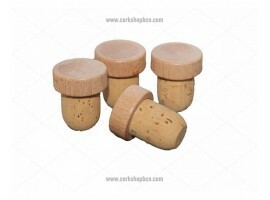 Cork stoppers with wooden caps for 3/4 litre bottles. Cap 30x15 mm. Stem 28 x19 mm. 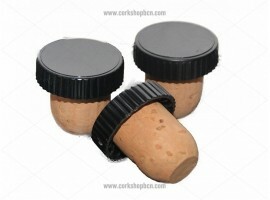 Plastic cap with cork stem for 3/4 litre bottles. Cap 30x15 mm. Stem 28x19 mm.